Growlmon is the Champion form of Guilmon, the Digimon partner of Takato, and the standard "dino" Digimon for season three of the series. Growlmon first appeared in 3.08, "A Question of Trust," and Digivolves to his Ultimate form of WarGrowlmon in 3.14, "Grow Mon Grow." Rather than import the Japanese mould for the Growlmon/WarGrowlmon toy, Bandai of America constructed one of their own, which shows that their skill designing figures has definitely improved since the first Digi-Egg toys. The toy comes packaged in Growlmon form, so we'll begin with it. The thing which *immediately* strikes you here is the TERRIBLE, HALF-ASSED paint-job the figure has been given. More than two thirds of his black detailing has been left uncoloured. It's all clearly marked out with indentations - but it hasn't been coloured. BAD BANDAI! LAZY BANDAI!! This half-done paintjob occurs a lot with the Tamers Digivolving figures, but it is definitely at it's utmost worst with Growlmon, given that he is only three main colours, and the poor job REALLY sticks out. In fact, I was SO annoyed with it, I actually took a black permanent marker to the toy, and coloured in all the empty areas. It improves the look of the toy many times over, and I encourage anyone who owns it to do the same. The pictures on this page are of the toy after I coloured it (click HERE to see my modified Growlmon from the back, and HERE for a list of parts that were and weren't coloured on the toy originally). 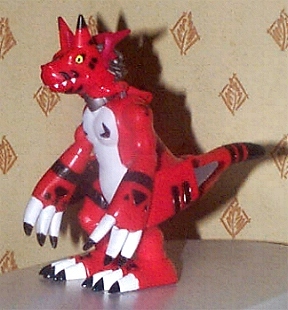 Now, as for the actual toy - Growlmon is a nice, sturdy figure, with bright colours, and next to no kibble, except for the visible part of WarGrowlmon's neck. He has articulation in his shoulders, elbows, hips and ankles. His bright colour scheme makes him an attractive toy (and the effect of this is enhanced by colouring in the black areas). For some reason I can't fathom, his tail is hinged used the same hinge that opens his back, and is held down with a lock, but this has no use. To transform Growlmon to WarGrowlmon, first you remove the peg on each of the arm blades from the hole in his forearm, and extend the blade inside it. You rotate the sections of the arms with the blades on them around, and fit the pegs on the extended blades into the holes in the backs of his hands (though they are so small and rubbery, it's almost impossible to make them lock, so don't strain yourself). You remove his middle claws, rotate them, and reinsert them to form WarGrowlmon's thumb claws. Then, you split Growlmon's head open revealed WarGrowlmon's head, and open out his back section. You pull out WarGrowlmon's tail-cable-thing from inside the body, and fold Growlmon's head halves inside. From inside the front half of the body, you bring out WarGrowlmon's armour, which is in two parts, attached by a series of interconnected hinges, which can be a serious bugger to get folded just right. Unfold the "missiles" inside the armour, bring the armour up around his shoulders, and close his back. Fit the pegs on the armour into the holes in his shoulders, and snap them together in the front. The instructions fail to mention the final step, where you lock the armour together tightly by fitting the two holes in the joint at the base of the tail-cable over the two rear pegs on the armour. You then fold up the two "missiles" at the back of the armour. The only thing exclusively missing in terms of black paint on WarGrowlmon are a few flecks on his nose. This is really because his whole body is Growlmon's, with all it's missing paint - it's a bit disappointing to see that the only major change is that he's got a new head and shoulders, and everything else below that is pretty much the same. 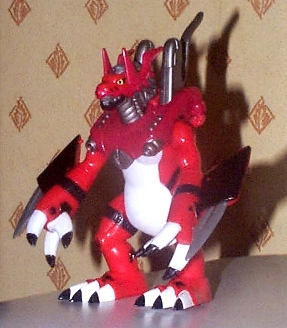 WarGrowlmon has articulation in all the same places as Growlmon, but kids would likely have difficultly getting his armour put together properly - I know I did! Also, transforming him back to Growlmon is quite a pain the first few times, as the armour is *very* difficult to fold up. You have to have all the hinges set in a certain way (look very closely at the picture in the instructions... wish they could make it bigger), and you have to have the "missiles" on both parts unfolded just a certain amount to let the pieces overlap, but not so that they affect the closing of the back. WarGrowlmon lacks a little of Growlmon's sturdiness, due to the really loose nature of the pegs that hold the blades to his hands (if you can even actually manage to get them in the holes), plus the shoulder armour, which just falls apart if you don't have the joint at the base of the tail-cable locked in place. But he's still a nice mode. I rather wish that you didn't have to remove his claws and reinsert them - that just makes me think of the Armour Digivolvers, with their removable heads and armour pieces... Growlmon, thankfully, is a far cry from them.